I am happy to share with you today that I am Guest Designing this month with Serendipity Stamps on the Serendipity Stamps Challenge Blog for Challenge #44 "My Guy". Serendipity makes stamps and dies with some of the most beautiful images and designs. For today's post I have two cards to share with you that would be perfect for a birthday or even more appropriately this month as Father's Day cards. For these I worked with the Golf Bag Cling Stamp set. 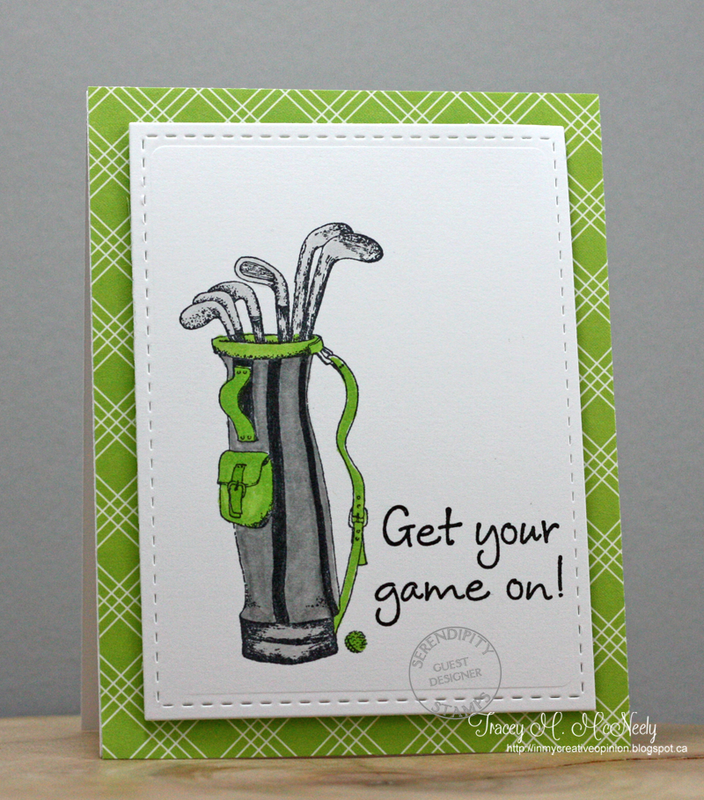 For my first card I stamped the golf bag image on a white panel with Memento Tuxedo Black and coloured the image in with Copic markers--YG23, YG25, T1, 2, 4, 6. The sentiment was stamped with VersaFine Onyx Black. For the second card I stamped the image with Memento Tuxedo Black and then coloured over the grass with YG23 and coloured the tee in with R05. The sentiment was stamped with VersaFine Onyx Black. 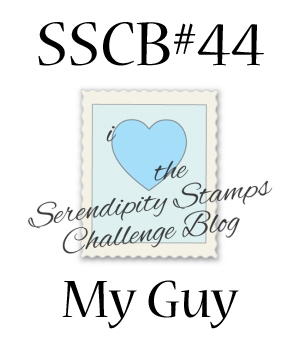 I hope that you come over and play along at the Serendipity Stamps Challenge Blog this month. There is a chance to win a $20 Gift Certificate for Serendipity Stamps. Thank you Mary and the Design Team for having me play along with you this month--I will see you again on the 17th! These projects are part of Kathy Racoosin's 30 Day Coloring Challenge 2. Anyone can join in at any time over the 30 days. I am also submitting both of these to the Simon Says Stamps Wednesday Challenge - Make It Masculine! LOVE your awesome masculine cards Tracey. YAY ~ congrats on guesting this month! Love the fresh greens on your first card Tracey!! The second is CAS fun!! These are gorgeous! LOVING the golf theme!!!! Congratulations on your guest spot! Your cards are super cute and the coloring is wonderful!! Thanks so much for guesting! LOVE your clean simple cards! Great CAS guy card Tracey! You are a wonderful addition to the Serendipity Guest Designers...welcome! After your post yesterday, I was sad in thinking we wouldn't see you for a bit, but here you are: YAYYYYYY! Congrats on your GD role and wow...what a fabulous card you've created! Impressive colouring my friend! These are fantastic! Congratulations on the GD gig! Well deserved! Had to stop over here to get a better look at the golf bag... it is fantastic, Tracey!! Congrats on the Serendipity GD spot! yay for guest designing.. these cards are awesome.. love that golf bag..
You're so good at showing off a company's products, no wonder they wanted you as a Guest Designer. Great masculine cards, Tracey. These are both fantastic. Love how you colored, too. 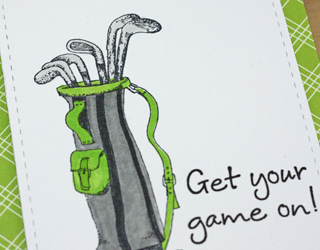 Love your golf card. Great background look. What a perfect masculine card Tracey. Love the images and the coloring. That green shade looks amazing. Congrats on your GD spot! Love both of your cards! My hubby would love the one with the golf bag. Golf is his favorite sport and green is his favorite color! Fantastic masculine card, Tracey! Your image and sentimen are perfect together and your coloring looks great. 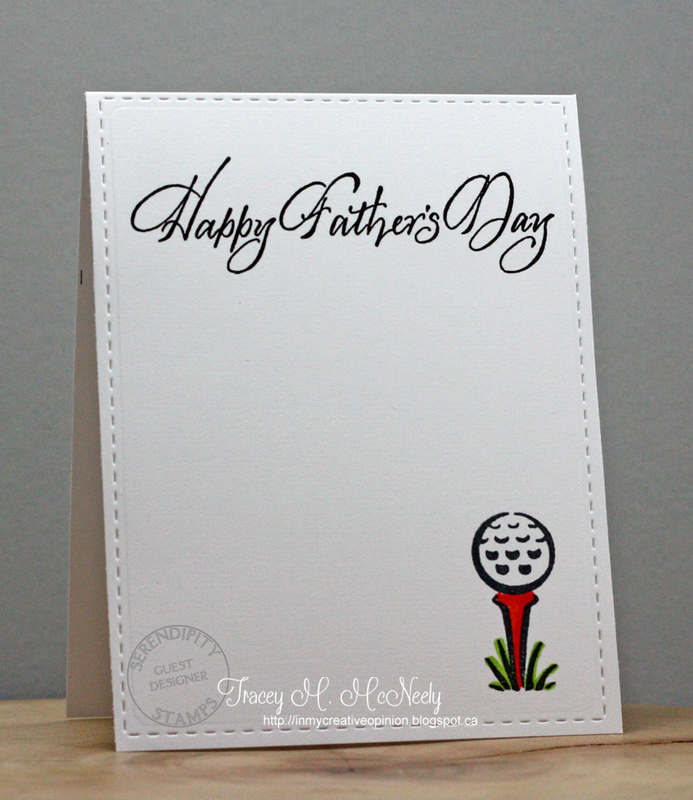 I love your sweet Father's Day card...your golf clubs are so fabulous! Such sweet masculine cards! Love the golf themes! Love that green/gray combo, and your second card is so deliciously CAS... great font! Awesome masculine card! The golf clubs and color combo are perfect! Congrats on your Guest Spot! These are wonderful Dad day cards! Love the colors & CAS design. This is so perfect and love the inside!! Life has been busy and just getting a chance to peek!!! Ha.....thought the second card was the inside...what can I say...I'm slow!! Hope you're getting settled in your new home or getting settled packing etc. Saw the pics but no time to comment....looks fabulous!